Posted on Thu, Mar 22, 2012 : 2:59 p.m. There will be an "Empty Bowls Dinner to Benefit SOS Community Services" on Friday at the Whole Foods Market - Cranbrook. 6 to 8 p.m. Participants can enjoy a dinner, and then choose a keepsake bowl from among a selection handmade by members of the Ann Arbor Potter’s Guild. All proceeds benefit SOS Community Services. $20. To purchase tickets, and for information, call 734-961-1207 or visit soscs.org. The WFC is at 990 W. Eisenhower Pkwy., Ann Arbor. 734-997-7500. 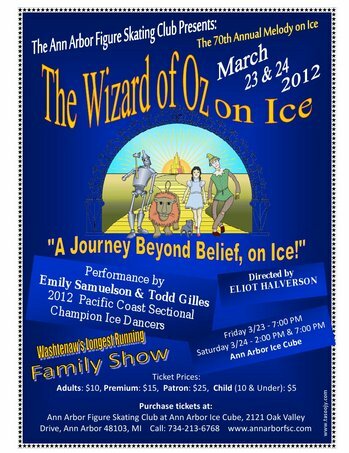 See the "70th Annual Melody on Ice: Wizard of Oz on Ice" at the Ann Arbor Ice Cube this weekend. See the "70th Annual Melody on Ice: Wizard of Oz on Ice" at the Ann Arbor Ice Cube this weekend. Friday and Saturday, 7 p.m. Saturday matinee at 2 p.m. Champion ice dancers Emily Samuelson and Todd Gilles will help bring the classic story to life. $10/ adults; $5/ children under 12 and seniors over 65; $15/ Premium mid-center seating; $25/ Patron upper center seating. Tickets are available in the AAFSC office or by calling 734-213-6768. The A2IC is at 2121 Oak Valley Dr., Ann Arbor. The "Annual Spring Equinox Craft and Psychic Faire" will return to the Crazy Wisdom Bookstore on Saturday. 11 a.m. to 4 p.m. Artisan tables will feature wands, staffs, dream catchers and native art, textiles, jewelry, Waldorf crafts, woodcraft, flower essences and hand-dyed silk scarves. Free admission. Tarot and psychic readings are $1 per minute. 114 S. Main St., Ann Arbor. 734-665-2757. LEGO fans, get ready "Brick Bash! 2012" at the Morris Lawrence Building on the Washtenaw Community College campus on Saturday. 11 a.m. to 6 p.m. This is a public LEGO building exhibition for all ages. Builders from around the country meet to show off their amazing creations, and piles of LEGO await your own creative efforts. There will also be Duplo for the little ones, educational hands-on projects, robotics and animated films. Free. WCC is at 4800 E. Huron River Dr., Ann Arbor. 734-973-3300. The "30x30 Benefit Art Show" returns to the Ann Arbor Art Center on Saturday and Sunday. Noon to 5 p.m. Thirty artists accepted thechallenge to create 30 works of art in 30 days to be sold to benefit the Art for Kids Scholarship Fund. The scholarship provides tuition and art supplies to enable kids to take art classes who otherwise would not be able to do so. All works of art will be sold for $40 each. 117 W. Liberty St., Ann Arbor. 734-994-8004 x101. The "Annual Comedy Jam to support the Michigan Firehouse Museum" will be held on Saturday at the Michigan Firehouse Museum. 7 and 9:30 p.m. Noted comedian Rex Havens will do his one-man theatrical comedy performance entitled, “Bidding You A Fond I Do.” $25/general seating; $35/premium seating. 110 W. Cross Ave., Ypsilanti. 734-547-0663. The Performance Network’s "30th Anniversary Gala: Home Grown, World Class" will be held at the Kensington Court Hotel on Saturday. In addition to the Angel of the Arts Ceremony, the gala will include a seated dinner, live and silent auctions and a musical retrospective featuring performers John Seibert, Jennifer Joy, Brian Thibault and more. $125.Tickets can be purchased on the web, over the phone at 734-663-0681 or at the theatre’s box office at 120 E. Huron St., Ann Arbor. The KCH is at 610 Hilton Blvd., Ann Arbor. 800-344-7829. Fri, Mar 23, 2012 : 1:20 a.m.
Of all the things listed above, Brick Bash is by far the coolest!